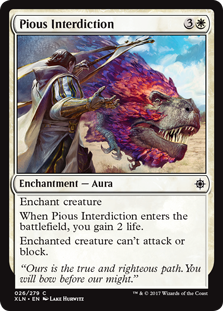 Often competitive players will look at a card like Pious Interdiction — which has what might be a desirable effect if at a hefty cost — and discard it out of hand. Mike — winner of his Midnight Prerelease — can certainly point to a time! That’s right! Pious Interdiction can certainly get it done in forty card decks! … That’s actually how Patrick and Mike got into the discussion this week! Mike was lucky enough to open four copies of Pious Interdiction, and they did such a great job of nullifying his opponents’ key flyers or fat green creatures he was almost ready to sign up for Pious Interdiction in Constructed. The problem — part of the problem anyway — with Pious Interdiction is just the cost. The cost is both the “right answer” and too simple of an answer, though. While this aura is great at interacting with threats like Sealed Deck where so many of an opponent’s cards will be more expensive than in Standard, four mana can be a big ask in sixty card decks. Patrick is quick to caution that general rules about how much things “should” cost for certain effects can be foolhardy. We must always be mindful of context. 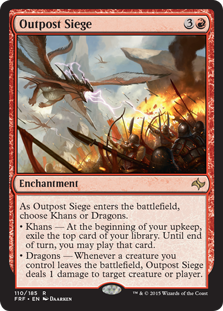 Cast Out also costs four mana, but has so much flexibility around Flash, Cycling, and the option to exile non-creature permanents. For that matter, Cast Out does a much better job, generally, of interacting with creatures! 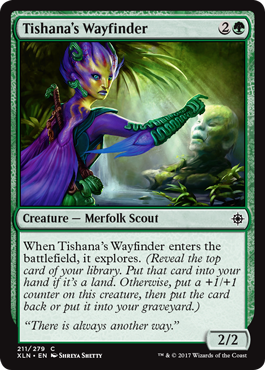 Cast Out isn’t always better for four mana, as there are times you will want to gain two life… But it’s usually better. If you’re really in the market for an overcosted Pacifism that gains life, might we suggest a Desert’s Hold? 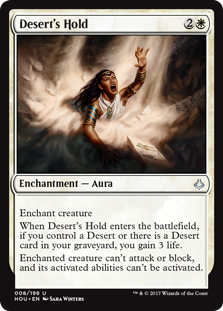 Desert’s Hold doesn’t let you get away with deck building free or anything… You have to build your deck with Deserts — and you have to have Deserts either in play or in the graveyard to get the bonus — but it both costs less mana and gains more life than Pious Interdiction. Yet Desert’s Hold is far from a popular Constructed card. Join Pro Tour Hall of Famer Patrick Chapin and Michael J Flores in this eye-opening theoretical discussion, plus more — much more — actual Constructed quality cards from Ixalan in this week’s episode! 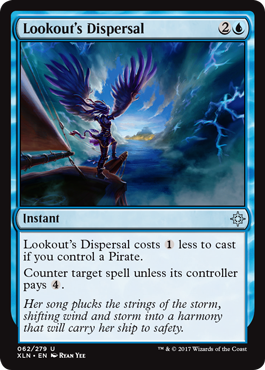 Yes, yes — this sweet new counterspell is kinda sorta a Metallic Rebuke for the Pirates tribe. What if, by the way, you try this with Metallic Rebuke in a Pirates deck exploiting a lot of treasure tokens? Pretty cool, huh? It’s All About the Dinosaurs! What is up with this card anyway? 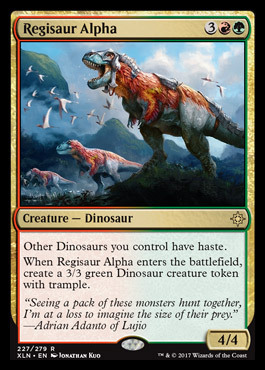 Regisaur Alpha offers seven power over two bodies — three of which have haste — all for five mana! Regisaur Alpha and Huatli cost the same [total] amount of mana. Assume you’re spitting out a 3/3 the first turn you control Huatli. Now, which would you rather have? 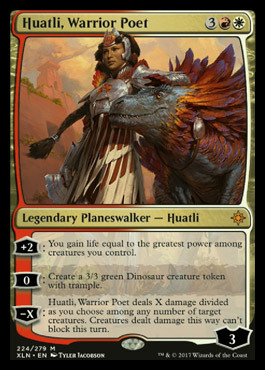 Regisaur Alpha’s 3/3 token is better than Huatli’s 3/3 token, too… Just on basis of haste. That’s right! How much would you pay for a Fireball where x=7? You’d pay eight mana, right? Well Gishath costs eight, and does seven damage with haste… He’s kind of an eight mana Fireball, therefore. Everything else is gravy. The vigilence is going to be awesome… But it’s awesome gravy. Next turn’s attack? Gravy. This is not to say you should actually pay to get Gishath onto the battlefield… Just if you had to, it wouldn’t be that bad of a deal. 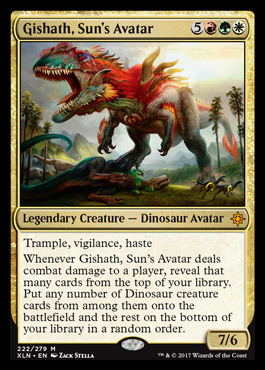 There are even more dinosaurs discussed in this week’s episode, which takes Ixalan from one green mana to the aforementioned eight drop… and more! 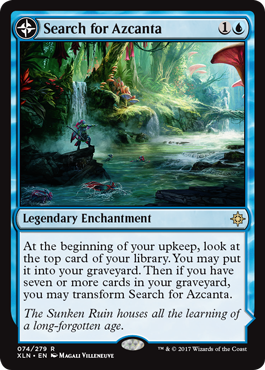 Jace, Cunning Castaway: Ixalan PlaneswalkerMichael notes that Jace seems to have gotten ripped in the Gatewatch. 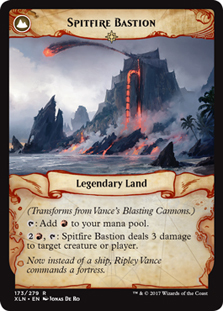 Patrick notes that Jace, Cunning Castaway boasts one of the fastest Planeswalker Ultimates ever. 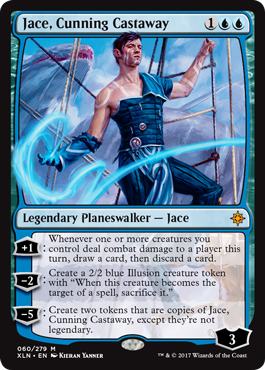 You might as well Ultimate when Jace’s loyalty hits 5 BTW; while the token copies are not Legendary, Jace, Cunning Castaway itself is. People just didn’t play Gideon of the Trials because they were already playing Gideon, Ally of Zendikar; now there is no disincentive. More importantly, having more than one kind of Gideon in play will give players greater protection for their Platinum Angel-like Ultimate. 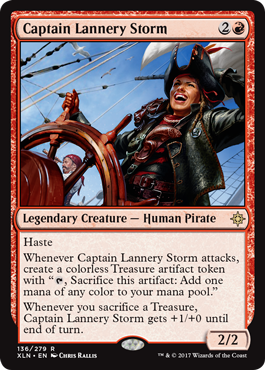 Captain Lannery StormLayered and flexible, the Captain is probably Mike’s favorite card in Ixalan. Use her treasure for mana! 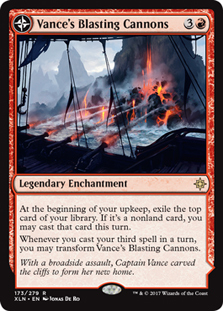 What about not pumping the Captain, but just sacrificing her treasure to cast a Shock, Magma Spray… Or even a Fatal Push? Pro Tour Champion Patrick Chapin and Resident Genius Michael J. Flores talk all the Ixalan that’s fit to discuss; spoiled cards, flavor and aesthetics; and of course brewing! 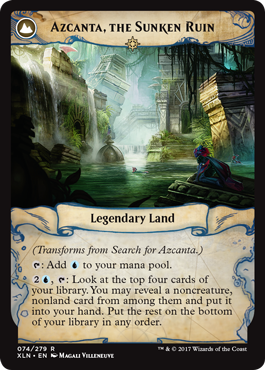 Check out Top Level Podcast’s first take on Ixalan right here, right now!